As a highly satisfied owner of MiniDisc equipment, I encourage everyone to consider the format as a permanent replacement for cassettes. The MiniDisc is the logical successor to tapes, just as the CD was to vinyl records. It's important to note that the MiniDisc is primarily a recording medium. It was not designed as a replacement for the CD, just the decades-old cassette tape format. Confusion over the MiniDisc's intended purpose plus early technical limitations and high cost made its initial acceptance slow outside of Japan, but things have changed. In late 1997, Sony (inventor of the MiniDisc) lowered its prices and the format is now within the reach of most consumers. MiniDiscs are a digital recording & playback format much smaller than a CD, yet capable of delivering virtually identical sound quality. Each disc is encased in a protective housing measuring roughly 7cm x 7cm x 5mm thick. The image above is close to the actual size at 800 x 600 resolution on a 14" monitor. In addition to the housing is a plastic sleeve for each disc. Their compact size and durability makes MDs ideal for use outside the home. 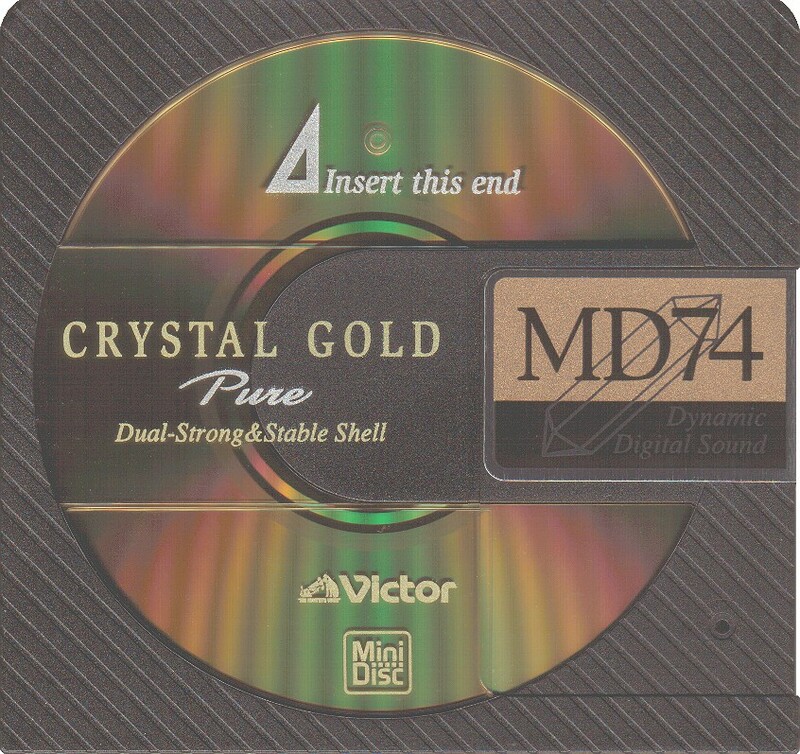 A typical MiniDisc stores up to 74 minutes of stereo music and newer MDs can hold 80 minutes. The key to fitting all that information into such a small space is ATRAC (Adaptive TRansform Acoustic Coding). Part of the ATRAC algorithm removes sounds that are masked to the human ear. For example, if a loud drum-strike occurs on top of a much softer one at a specific frequency and volume, the latter can be removed without the human ear noticing. This is done with sounds that are completely masked, like a waterfall drowning out the sound of a nearby stream. Sounds that are partially masked are represented with fewer digital samples since the ear can't hear them in full detail. The ATRAC algorithm is complex, but it works very well and has been refined to near perfection. You can do a crude masking demo at home by clapping loudly at the same time someone else snaps their fingers. Under the right conditions the finger snap will be inaudible. There is a lot more to ATRAC than just masking, though. It uses other tricks to compress the bulk of the data, but they are beyond the scope of this review. Visit the links at the bottom of this page for in-depth articles. The term "compression" is often used to describe ATRAC, but it's a misnomer because frequency range and dynamics are left intact. "Perceptual coding" is the accurate term. If it helps aesthetically, just think of MDs as CDs with the hidden clutter removed. Any recording process involves some alteration of the source, so it's not fair to say that masking algorithms violate a universal standard of purity. Some very good science has gone into the MiniDisc and it's almost as remarkable as the invention of the CD. It allows CD quality audio to be stored at roughly a 5:1 ratio to the original digital source by using efficient 20-bit storage and the aforementioned perceptual coding. Good sound quality can even be obtained at a 12:1 ratio with the MP3 (MPEG Audio Layer 3) format. Download an MP3 player and some songs to hear how well perceptual coding works with over twice the data reduction of ATRAC. 160kb MP3 files have very good quality if you can find any. Note that MP3 sound quality is highly dependent on your computer's sound card, the sampling rate and the source material. Most cards add noise to the output and people who make MP3s can be sloppy about it. To get the purest MP3 sound you need an error-free file and a sound card with digital output fed into a good stereo system. When the MiniDisc first came out in 1992, the ATRAC scheme wasn't quite perfected and some people noticed rough edges (mainly treble) in certain music. But with the latest ATRAC versions the differences are insignificant, especially in the mobile/portable environment where the MiniDisc excels. Critical listening comparisons should be done with decks using ATRAC 4.0 or newer (which were generally built after 1996). Even when you listen on good headphones, you hear no evidence of "missing" music in any frequency range. All the subtle detail and instrument placement remains intact. Don't let anyone tell you that MiniDisc sound quality is less than superb. Bench-test definitions of sonic purity are much different than actual human hearing. ATRAC may improve slightly in years to come, but it's already so good that most people will never notice. Note that the playback decompression algorithm is fixed, so if you buy a player now you aren't missing out on small future recording improvements. Wariness of acoustic masking among audiophiles is based on theoretical principles that are of minimal value in the real world. You may recall that the CD was criticized as a lossy format when it first appeared, because it "removed" minuscule segments of sound during sampling. Arguments against the MiniDisc are similar in many ways. Most of the skepticism is based on hearsay, technical ignorance, archaic ATRAC versions, audiophile snobbery, overblown fears of piracy or the old pastime of criticizing anything new. But masking technology has actually been around for decades, with Dolby Labs as one of the pioneers. If it sounds basically identical to CDs and much better than the cassettes it was designed to replace, does it really matter that data was removed? Time spent bickering about purity could be better spent enjoying the MiniDisc's superb sound and practical features. The MiniDisc is recordable and sounds essentially identical to a CD, with no noise, wow & flutter or tape-breakage to worry about. Some people think MDs actually sound better than CDs in a mobile environment because the removal of masked sounds may reduce the load on compact speakers. If the human ear can't hear masked sounds, speaker-motion is theoretically wasted trying to reproduce them, which might add slight coloration to the music. This topic is worth further investigation. The only cassette technology that comes close to the MiniDisc is Dolby S, but Dolby S tape-transports must be extremely precise and most car players just have Dolby B or C. Even if Dolby S was practical in affordable car decks, it would still carry all the mechanical limitations of the cassette format. The recording process is very straightforward on the latest MiniDisc decks, and you can dub via digital or analog cables. You can copy CDs, cassettes, LPs or any preamp-level source. In digital mode, recording levels are set automatically. If you have a CD changer, all you need to do is program tracks on multiple discs and walk away for up to 74 minutes. The ability to re-record (up to a million times) with no loss in quality can be invaluable, like the ability to edit text in a word processor. Song mixes can be changed over and over when you get tired of certain tracks. If you find a higher quality source for an existing track, replacing it is very simple, etc.. Former cassette users may find that they made lots of redundant tapes just because they couldn't edit old ones. Songs can be divided, combined, deleted, renumbered and given digital titles; things that are difficult or impossible to do with a cassette tape. Using combinations of these features, you can remove unwanted noises (like clicks in LPs) with a precision of 0.06 sec. or greater. The divide feature is very handy when you want to break up a multi-part song like a rock medley or a classical piece containing several movements. Put divide markers anywhere in the track and the player will treat each location as a separate song. And if you want to hear the entire track, the divides are seamless; all you see is the track number and digital title changing in mid-song. In the rare case of a bad segment on a disc, just save the bad segment as a temporary track to prevent it from being recorded on, then delete it when done (this can't be done with a linear CD format). Track access is a matter of skipping songs with the push of a button rather than waiting for a tape to rewind or fast-forward. Tape music-search doesn't always work and is useless for tracks with merged beginnings and endings. The MiniDisc eliminates these annoyances. MiniDiscs are less subject to shock-interruption than CDs, in part because they are physically smaller and have less flex. The shock buffer (typically 10 seconds or more) is an integral part of the system. Data is read, stored, and played back in increments. Because of the buffer the disc doesn't need to be constantly spinning, which further reduces vibration hazards. MiniDiscs take up less space than tapes or CDs and can free up a lot of room in your glovebox or dash. Each disc has its own plastic sleeve which is only millimeters bigger than the disc itself. The small-size advantage becomes very apparent when you've lived with the format for awhile. The MiniDisc puts the biggest possible sound in the smallest possible package, which is only logical considering the trend toward miniaturization in all electronic gadgets. In a mobile environment, handling and loading a MiniDisc is considerably easier than a CD. You don't have to worry about scratching the disc or holding it by the edges. CDs were never really designed to be a front-loading medium. MDs are cousins of the floppy disk so they're ideal for front-loading car decks. At first I found MDs slightly harder to handle than cassettes, but I quickly learned to handle MDs by feel, using the non-labeled side of the sleeve as a reference for "face up." Note that a disc may not lock properly in its sleeve unless its label shows through the clear side. Keeping a large CD collection in your vehicle can present a problem if you also like to listen to the same discs at home, not to mention the huge loss if they are stolen. The MiniDisc solves the CD quandary by letting you dub from your CDs and leave them at home. And unlike standard CDs, the MiniDisc's recordability lets you choose only the songs you want to hear. I have never found the concept of CDs in a car very practical. They get dusty and scratch easily, and they're awkward to handle, especially if kept in their jewel cases. And who really wants to listen to one artist per disc and wade through mediocre tracks to get to the good ones? Even with CD changers and track programming, time is wasted jumping around. I suspect most people accept this because they are unwilling or "too busy" to learn recording techniques. But the MiniDisc simplifies recording and should give people more incentive to do so. The main issue for me was the thought of re-doing the music I already had on tapes, but the sonic and practical improvements made it an easy choice. See below for the downsides of recordable CDs. MiniDiscs are very durable and it's claimed that they can be recorded on a million times with no loss of quality (if kept clean). The recording process uses a laser to super-heat tiny spots on the disc in conjunction with a magnetic field. A magnetic head contacts the non-sensitive side of the disc during recording, but there's no contact at all during playback. MDs are highly resistant to magnetic fields and temperature swings. Sony claims the data will remain pristine for 30 years; probably much longer. Compare that to tapes, which slowly deteriorate after the first use. Some people think re-writable CDs (CD-RW) are an ideal format, but they are ignoring the MiniDisc's compactness, durability, editing features and lower lifetime cost. The same applies to upcoming recordable DVD or any CD-sized format. A big issue with CD-RW is that re-writable CDs, due to their lower reflectivity, cannot be played in most of today's audio CD players (most CD-R record-once discs can). Another problem with CD-RW is that non-jacketed discs pick up scratches in front-loading mobile players. Surface flaws can sometimes interfere with playback and seriously affect the ability to re-record on sensitive discs. CD-sized discs are also more subject to skipping and harder to manipulate, as mentioned above. CD-RW discs cannot be edited at random after the first pass. You can only redo the last track or the entire disc; very primitive compared to the MiniDisc's flexibility. Yet another drawback is that CD-RW discs are up to five times as expensive as MDs. Recordable DVD is projected to be even more costly. CD-R discs are currently cheaper than MDs but the gap is closing and they have the drawbacks of all larger, non-jacketed formats and no after-the-fact editing features. The cheaper initial cost of CD-Rs is lost the first time you need to re-do a disc and have to trash the whole thing. You also spend more time organizing track lists and re-burning a CD-R than you do editing specific tracks on an MD. These formats can certainly co-exist but I think the MiniDisc is superior in many ways, especially for mobile use. No technology is perfect and I've found some limitations, but they are trivial compared to the MiniDisc's advantages. I list them here for objectivity's sake. I hope everyone who reads this will consider a MiniDisc deck and help make the medium less expensive for all of us. It doesn't belong in a rare niche market like DAT (digital audio tape). MDs should be sold wherever cassette tapes are sold, with a reasonable price of about $2 per 74 minute disc. Home decks are already available below $200 and prices should continue to drop as more people are exposed to this amazing format.